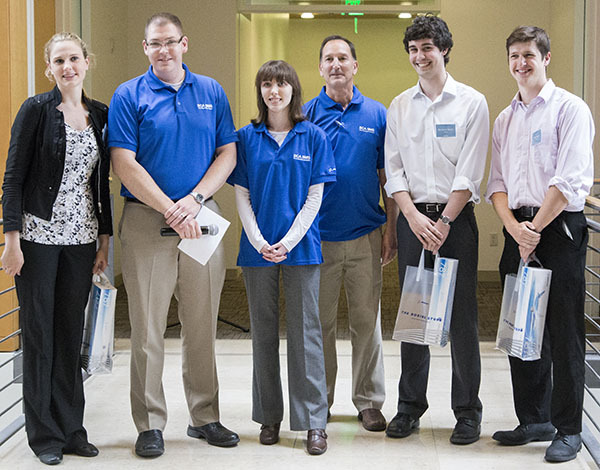 Students in the School of Electrical Engineering and Computer Science (EECS) won three of the four overall awards at the Engineering Expo 2015. Additionally, the Industry Advisory Board for EECS recognized six other outstanding projects. The Boeing Engineering Excellence Award distinguishes a project team that delivers a robust and innovative solution with a clear focus on enabling potential customers to excel in their markets and missions. Amber Hartman, Benjamin Narin and Kai Ovesen win the Boeing Engineering Excellence Award at OSU’s Engineering Expo. Photo by Gale Sumida. Winner: EyeRobot. Team: Amber Hartman, Benjamin Narin and Kai Ovesen. This project aims to help people with ALS (Amyotrophic Lateral Sclerosis) or similar diseases in which people lose motor control. Using eye gaze, the Electrooculography (EOG) headset provides an emergency stop for those who cannot physically hit a button. The project is in collaboration with researchers at the Personal Robotics Lab at Oregon State University who are developing a wheelchair that can drive itself using way points set by eye-tracking equipment. The head set measures electric potential across the eyes from two sensors placed on the temples. The Tektronix Commercialization Award winners will be evaluated based on the level of innovation and potential impact in the market. 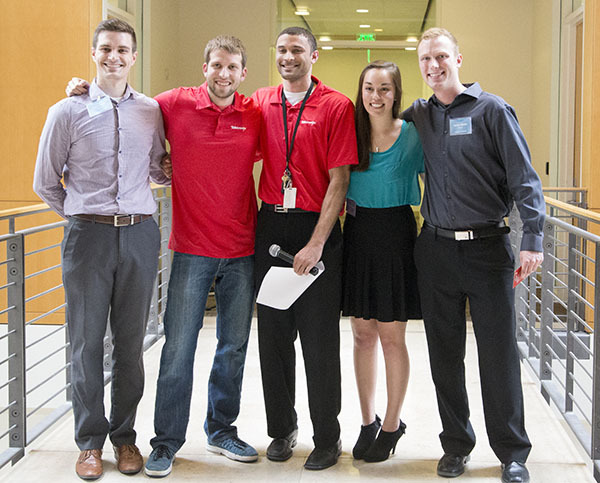 Trevor Buys, Megan Kamiya and Jordan Belisle win the Tektronix Commercialization Award at OSU’s Engineering Expo. Photo by Gale Sumida. This custom car head unit for controlling the car stereo is a low-cost upgrade that has multiple audio input options and other connection capabilities including WiFi. The system also collects car data and generates web displayed reports on driving patterns. Video of Eye Gaze System. The People’s choice award was voted on by attendees to the Engineering Expo. Winner: Eye Gaze System. Team: Sultan Alyamani, Trevor Fiez and George Vartanov. This device is designed for individuals who have motor restrictions. Our goal for this project is to create an inexpensive eye gaze directional detector. Current eye-gaze systems use expensive technologies that are limited in their utility. First place: OSU Rocketry – Payload Electronics. Team: Elliott Fudim, Tyler Giddings and Sagar Rotithor. The OSU Rocketry team has built a rocket capable of ascending a 10 pound payload to 25,000 feet for the 2014 Experimental Sounding Rocketry Association (ESRA) intercollegiate competition. The Payload Electronics Team designed a payload that will conduct experiments and collect data during the rocket launch. Second place: Persistence of Vision Globe. Team: Harry Bloom, Matthew Eilertson and Masa Kawaharada. This functional persistence of vision (POV) globe utilizes LEDs spinning on a spherical frame in order to create a three-dimensional optical illusion of the Earth. The human eye can only retain an image for one twenty-fifth of a second. By flashing LEDs at precise increments as they rotate at a rapid speed, we can trick the human mind into seeing continuous lines of light, which will project an image. POV Globe video. Third place: Smart Disk Wireless Switching Device. Team: Rachael Carlson, Alan Huang and Keith Kostol. Is your light switch in the wrong place? The Smart Disk operates lights wirelessly so you put your light switch anywhere. Smart Disk video. First place: V2x Systems and Integration. Team: Stephen Austin, Ashley Greenacre, Chris Harper, Faith Steltzer, and Sam Quinn. V2x Systems video. If cars could talk roads would be safer. This project combines sensors, networking, and an in-vehicle display to make driving safer by sensing when accidents occur and communicating the crash information to emergency responders and other vehicles on the road. Second place: Camera Test Drone. Team: Loren Brown, Justin Cheng and Ken Hafdahl. Vibration can be a big problem for cameras mounted on a moving vehicle. This anti-vibration system combines mechanical, electrical, and computer science elements to record and process flight video from a variety of cameras mounted to a quadcopter. Camera Test Drone video. Third place: World of Fitcraft. Team: Nick Bristow, Tracie Lee and Vedanth Narayanan. Having trouble getting fit? This app makes a game of exercise; users earn rewards and “level up” on their way to better health. World of Fitcraft video. Posted in Awards, Events, Student Stories. 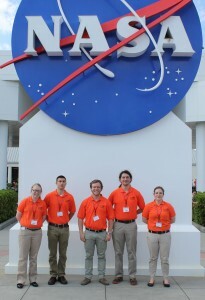 Auto Safe team at Kennedy Space Center from left to right: Ashley Greenacre, Stephen Austin, Sam Quinn, Chris Harper and Faith Stelzer. An Oregon State University team of computer science and electrical and computer engineering students earned third place at the Intel-Cornell Cup on May 1-2 at the Kennedy Space Center Visitor Complex in Cape Canaveral, Fla. 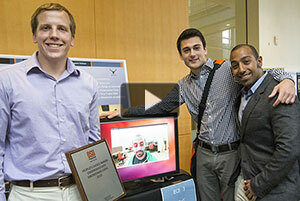 The purpose of the embedded design competition is to inspire student innovation. Entry into the event is competitive; only 22 teams from across the country were selected to attend. The chosen teams were provided with $1,500 in funding and the latest Intel Atom board which they incorporated into their project. The event was open to the public, so in addition to presenting to the judges, the team explained their project to crowds of elementary students who were visiting the Kennedy Space Center. “Our project was really fun for the kids because they could drive the simulator. One girl, who had never played a driving game before, stayed for a really long time,” said Ashley Greenacre, senior in electrical and computer engineering. It was the first time Sam Quinn, senior in computer science, had participated in a competitive event. “It was eye-opening to see the troubles that go on behind the scenes,” he said. The team had to deal with last minute networking problems, but rather than be upset by it, Quinn said that he really enjoyed high pressure problem solving. The hands-on experiences that the students receive by working as a team to design a product is why Kevin McGrath, computer science instructor and advisor to the team, recruits students to participate in the event every year. “There will always be challenges, and how you overcome those challenges dictates the kind of engineer you are,” he said. The Auto Safe project, called V2X, will be on display at the Oregon State Engineering Expo on May 15. 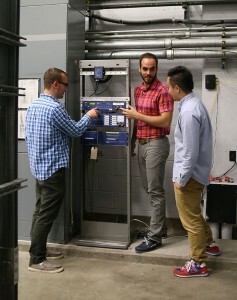 Ben McCamish, Eduardo Cotilla-Sanchez, and Ziwei Ke demonstrate the synchrophasor in the Wallace Energy Systems and Renewables Facility. Photo by Gale Sumida. Oregon State press release posted 5/7/2015. A new energy test bed using cutting-edge sensor technology has been located at Oregon State University, designed to gain a better understanding of the local electric grid. The Bonneville Power Administration awarded a $350,000 grant to develop a system that will provide a detailed analysis of load composition and power use. The project should help accommodate new types of load demands and new sources of renewable energy, such as wind and wave energy, while averting blackouts. The sensors, called phasor measurement units or “synchrophasors,” can take voltage and current measurements 60 times a second, compared to standard sensors that take measurements every two to four seconds. All data will be time-stamped and synchronized with a common clock, allowing researchers to track electrical spikes and other anomalies throughout the grid. A better understanding of these anomalies could eventually lead to a “smart grid” that can automatically detect blackout warning signs and disconnect portions of the grid to protect critical loads. “These synchrophasors will allow us to develop better load models,” said Eduardo Cotilla-Sanchez, an OSU assistant professor of electrical and computer engineering and leader of this project. “Currently, our cascading power outage analysis assumes the campus load to be like a giant toaster – a big resistor that doesn’t change over time – but reality is much more complex. Three of the synchrophasors have already been installed, and a total of seven will measure a variety of load types. The campus locations for the sensors include the Energy Center, the Salmon Disease Lab, Snell Hall, the photovoltaic array on Campus Way, and the Wallace Energy Systems and Renewables Facility. Two off-campus locations include a platinum foundry in Albany, and one near Newport at the future wave energy testing center, in collaboration with Consumers Power and Central Lincoln PUD. In addition to the research benefits, the project will allow OSU students to learn about the advanced technology. 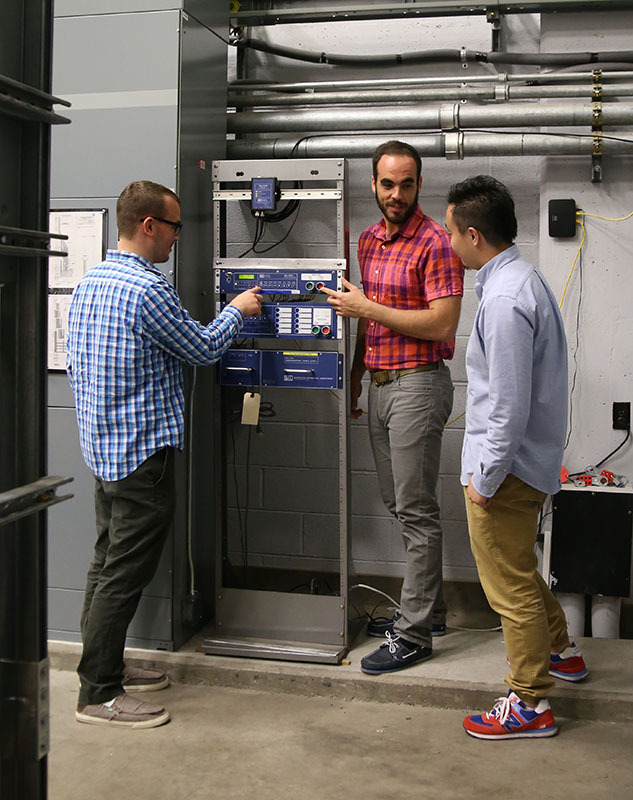 Graduate students involved in the installation and management of the system are getting hands-on experiences with the all the steps in the chain, from connecting the current transformer to data management and machine learning, which incorporates both electrical engineering and computer science. “Our students will really have an advantage by being exposed to this technology and having the opportunity to work directly with the local utility companies,” Cotilla-Sanchez said. In addition to the local utilities, the project involves collaborators from the BPA, OSU Facilities Services, OSU Information Services, and the College of Engineering information technology department.